A number of young Michigan targets were in action at the USA Developmental National Team Mini-Camp over the weekend in Colorado Springs. The event featured 44 top prep underclassmen including several Michigan prospects such as Hyron Edwards, Stephen Zimmerman, Eric Davis, Diamond Stone and many others. Michigan continues to press for class of 2014 commitments but has begun to make strong inroads with several top 2015 and 2016 prospects around the midwest. Eric Davis is hearing from Michigan, Michigan State, Duke, North Carolina and N.C. State at this early stage of his recruitment. Davis, a Saginaw native, has long been considered one of the top guards in the state of Michigan and now has a chance to display it on a national stage. J.B. Bauer, of GopherHole.com, was in attendance at the training camp and provided some first hand impressions on Davis’s game. Eric Davis played a lot of point guard this weekend, but he’s a combo guard that is always looking to score. His shot wasn’t consistently dropping this weekend, but he showed no fear in taking the ball to the rim against an impressive collection of lengthy wings and big men who were there to challenge him on defense. Davis was one of the most animated players in the gym this weekend, often talking to teammates and sharing quite a few laughs. While there were plenty of smiles when play stopped, he was about his business during games. Bauer also had the opportunity to watch Josh Jackson, a 2016 Detroit native who has impressed all summer. Jackson is already hearing from Michigan, Michigan State, Indiana, Purdue, Notre Dame, Iowa and Georgetown this fall. Josh Jackson passes the eye test with his length and athleticism, but early Saturday morning seemed to be just feeling things out. By Sunday evening, he was playing with great confidence, even giving a salute after one of several dunks. Sunday morning during a four-on-four fastbreak/transition drill he fired up the entire gym with an impressive two-way display. First on offense, he drove the lane and slammed home a contested dunk. Quickly, his team had to turn their attention to defense. Jackson turned on the jets for a sprint down the length of the floor and leaped high off the ground to block a dunk attempt from behind, drawing cheers from all of the players and setting the tone for the session. 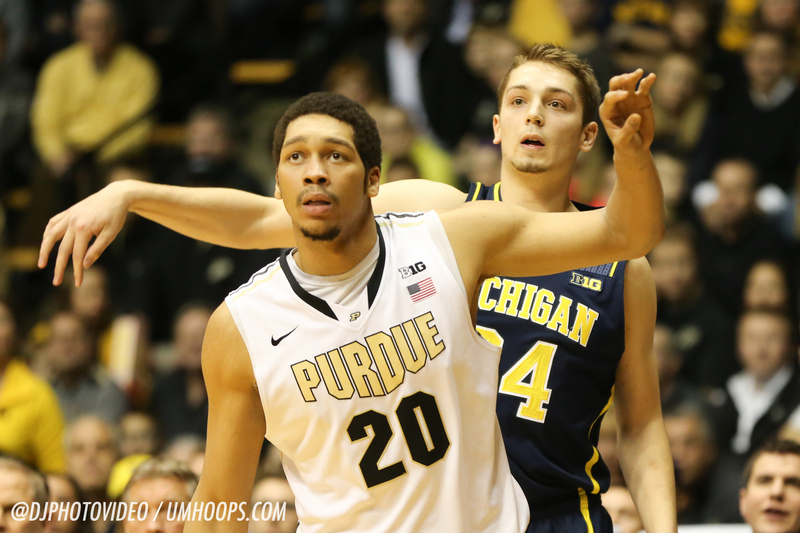 Although I’m not sold on Jackson’s jump shot at this point, he was effective slashing to the bucket this weekend. The 2016 wing also blocked a boatload of shots and used his length and quickness to come up with a number of steals and rebounds. I left the gym impressed with not only a great showing this weekend, but also with the amount of realizable potential that Jackson has. Diamond Stone is one of the top 2015 players in the country and has received some Michigan interest. Likely one of the top five 2015 prospects in the country, Stone will be highly coveted by a who’s who of major conference teams. Diamond Stone played like what he undeniably is – one of the top players in the 2015 class. There were a number of talented big men defending him this weekend, including some very good shot blockers, but Stone’s big body was difficult for defenders to stop down low. His size combined with a sweet, soft shooting touch and a number of nice post moves is best defended by keeping the ball out of his hands. Stone is absolutely the real deal. Stephen Zimmerman (Las Vegas, Nev./Bishop Gorman) had energy in the morning session. A face-up frontcourt player, if he rebounds with passion — as he did today — it takes his game up a notch. It was a quiet weekend for Hyron Edwards, who didn’t necessarily stand out as a smaller, pass-first point guard at the event. Edwards is reportedly planning to attend both Indiana’s Hoosier Hysteria and Purdue’s Tipoff Before The Kickoff in coming weeks. Another Indiana native, 2016 guard Eron Gordon was also in attendance but one 2016 name to remember might be VJ King. The Ohio native already holds an offer from Ohio State and is hearing from the likes of Michigan, North Carolina, Michigan State and Indiana as well.